Candace and Gavin waiting for a life-saving heart transplant. WHAT’S INSIDE Message from the CEO . . . . . . . . . . Message from the Director of Family Relations . . . .
5th Annual Vancouver Island Motor Gathering . . . . . . . . . . . . .
Gavin Gillies Family Story . . . . . . . . Message from the Chairman . . . . .
Honda Canada Foundation Partnership . . . . . . . . . . . . . . . . . . OUTFRONT Media Campaign . . . . . Thanks to Our Partners & Life Legacy Members . . . . . . . .
n the spring of 2016, Candace and Matthew Gillies welcomed their first child, Gavin, into the world. What should have been the joys of becoming first-time parents was instead a frightening scenario of their son fighting to live. During Candace’s nineteen-week fetal echo ultrasound, their child was diagnosed in-utero with heart defects. The unexpected diagnosis meant that their son would require immediate heart surgery once he was born. The couple was required to relocate to Edmonton for the last trimester of Candace’s pregnancy so that she could be monitored by the pediatric heart specialists at Edmonton Stollery Hospital in preparation for the upcoming birth. Gavin was born prematurely at thirty-six weeks into the pregnancy. Thirteen days later, Gavin underwent his first heart surgery to help correct heart defects caused by Shone’s syndrome. ow, what a summer! It is hard to believe that it has already come to an end. As we prepare for the fall season, I reflect on a summer that was filled with special events and annual campaigns that would not have been possible without the support of our partners. It has been a gift to see the Foundation’s supporters come together to raise money for Canadian transplant families from coast to coast. In June, I had the privilege of accepting the International Distinguished Entrepreneur Award (IDEA) from the University of Manitoba in Winnipeg, Manitoba. Later in June, I received a warm welcome from my hometown of Victoria, BC during an event beautifully hosted by my friends Patricia and Kenneth Mariash. This summer, we participated in the 2017 Vancouver Island Motor Gathering where $100,000 was raised by the GAIN Dealer Group, their sponsors, and the community. Not only is this a fabulous event, but it allows us to continue a very important conversation about organ donation with the community. I really mean it when I say we would not be able to do what we do without the support of our partners. For many, autumn means developing routines, selfreflection, gathering with the ones we love and acknowledging things that we are thankful for. This year, some families will not have the opportunity to settle into autumn routines or enjoy each other’s company in the comfort of their own homes. They will be uprooted from their home and fighting every day for their child’s life. The David Foster Foundation began with the belief that no family should face financial devastation to be by their child’s side during their transplant journey. David Foster at one of the first celebrity softball games in Victoria, BC. families we are fortunate enough to assist. It is easy to get caught up in the day-to-day obstacles life throws at us and lose sight of the more important things in life. Our family stories truly put this into perspective and remind us to slow down and spend time with the people we love. I encourage us all not to forget to take the time to be deliberate and intentional and tell the special people in our lives how much they mean to us. I am forever grateful to those who have chosen to support our Foundation and share a passion for our cause. The Foundation would not be celebrating 30 years of helping Canadian transplant families without your support. Thank you for reaching this milestone with us. Together, we have truly made a difference in the lives of others. That is something we can all be thankful for. Mike Ravenhill with wife, Cassandra, and daughters Amanda and Emily, at the 2016 Winnipeg Miracle Gala & Concert. s you are aware, the David Foster Foundation supports Canadian families that have a child going through the pediatric lifesaving organ transplant process and require financial assistance for non-medical expenses. A significant percentage of our financial support to families occurs while their child is on the waitlist for an organ transplant, which can be months or many years of waiting. Imagine, over 1,600 Canadians are added annually to the existing organ transplant wait list and every three days someone will die because they didn’t receive their transplant in time. The Challenge: Not enough Canadians are registered organ donors – less than 20% of Canadians are registered organ donors. To increase the national average by even 1% would require over 125,000 new signatures. OUTFRONT Media is truly demonstrating their support for our cause and making a positive change to the lives of Canadians. This is a perfect example of corporate benevolence, corporate philanthropy and corporate social responsibility. The David Foster Foundation is proud and honoured to include OUTFRONT Media as one of our new National Partners. The Solution: A substantial and sustainable National Organ Donor Awareness & Registration Campaign. Fact: The greater the number of organ donors, the greater the number of lives saved. The Challenge: The inordinate cost to launch a sustainable National Organ Donor Awareness & Registration Campaign. You can be part of the solution by joining OUTFRONT Media and the David Foster Foundation’s Organ Donor Awareness & Registration Campaign. Visit davidfosterfoundation.com and become a registered organ donor today. Together we can make a difference. The Solution: OUTFRONT Media. OUTFRONT Media has generously donated access to their 109 digital billboards located in five Canadian cities: Vancouver, Edmonton, Calgary, Toronto & Montreal. What does access to OUTFRONT Media’s 109 digital boards equate to? These are supersized digital billboards that are located on high-volume throughways of major cities and as a result the impact is dramatic. These billboards will generate an average of 800,000 impressions across Canada each day. This means that in a year, there will be almost 300 million impressions of the Foundation's important message about organ donation, thanks to OUTFRONT Media's billboards. n preparation for the celebration of the 30th anniversary of the David Foster Foundation, I found myself digging through archived records in hopes of finding clues on how to reconnect with some the families who have received funding over the last three decades. I was truly shocked to learn that in the early days, nearly fifty percent of the children did not survive while waiting for a life-saving transplant or passed shortly after their transplant. Organ transplants have come such a long way through medical advancements and anti-rejection drugs, yet the stress on families remains the same. â&#x20AC;&#x153;I was truly shocked to learn that in the early days, nearly fifty percent of the children did not survive while waiting for a life-saving transplant or passed shortly after their transplant.â&#x20AC;? It has been wonderful for our team to hear first-hand the experiences that many of the children have had because of the gift of life they have received. In many cases, a number of these children have now grown into adults and are able to reflect on what it meant to have their family by their side as they went through the transplant journey. It always gives us great joy to see the smiling faces and to receive updates from families about how they are doing. It is great to be part of helping so many Canadian families. I am very grateful to all of the families that have graciously shared their journey with us to give hope to others still waiting for their second chance at life. Even more heartwarming is the knowledge that each of our donors and supporters are helping to get us one step closer to reaching the goal of securing the legacy of the David Foster Foundation for generations to come. Lara Knudsen and Naomi, liver transplant recipient, having fun at the 5th Annual Vancouver Island Motor Gathering. "After 109 days on the waitlist, Gavin finally received the heart he so desperately needed to survive because of another family’s generous and compassionate decision made while they suffered their own devastating loss." Hospital. Having to relocate to Edmonton meant that Gavin and Candace would be separated from Matthew who continued to work back home in Calgary to support his family. At every opportunity, Matthew made the sixhour round trip to visit Gavin and Candace in hospital. Shone’s syndrome, also known as Shone’s Complex, is a rare congenital heart disease consisting of multiple left heart obstructive defects. Gavin had a pacemaker implanted to help combat the heart blockage. After five weeks in hospital, Gavin was discharged and Candace and Matthew were finally able to bring him home. On January 25, 2017, Gavin was placed on the heart transplant list. The family already had so much to worry about and the added pressure of maternity benefits ending in March loomed over them. 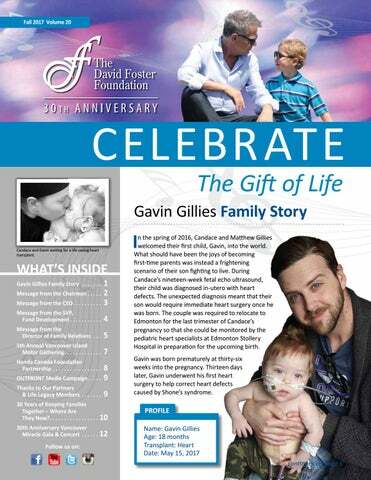 Shortly after Gavin was placed on the waitlist, their transplant social worker helped them submit their application for support to the David Foster Foundation. The Foundation financially assisted the family with travel costs so Matthew could continue to visit his family. The funding helped to ease the burden of the additional expenses in Edmonton and the household expenses they were struggling to cover while they waited for a donor heart. Three weeks later, Gavin’s condition deteriorated and he was once again hospitalized. In order for Gavin to return home, he was placed on home oxygen to help him breathe. For several months, Gavin continued to grow as a happy baby even though he remained on oxygen and was in constant heart failure. In November, Gavin returned to Edmonton Stollery Hospital for a heart catheterization and was put into a medically-induced coma to help drain the excess fluid from his body that was putting additional stress on his heart. After 109 days on the waitlist, Gavin finally received the heart he so desperately needed to survive because of another family’s generous and compassionate decision made while they suffered their own devastating loss. Gavin was eventually transferred back to Alberta Children's Hospital after being hospitalized in Edmonton and away from home for over six months. Today, Gavin is a happy toddler and the family is reunited back home in Calgary. The David Foster Foundation continues to support the family through their transplant recovery. Candice and Matthew finally get to bring Gavin home to Calgary after six months of him being hospitalized in Edmonton. Gavin desperately waiting for a heart transplant he needed to survive. n Sunday, August 27th, the David Foster Foundation had the opportunity to be a part of the 5th Annual Vancouver Island Motor Gathering with community partner, GAIN Premium Dealer Group. This was the Foundation’s third time participating at the event and it is always incredible to see the community support. This year, $174,850 was raised in support of the Foundation and the Cowichan District Hospital Foundation. The event brought in 10,000 spectators and 95 sponsors, who beat the heat to admire 540 classic, unique, modern and custom cars and motorcycles, all while supporting the 2 charities. The Foundation was honoured by the generosity and passion shown by GAIN Premium Dealer Group and all of those who came out to get involved and make the event a truly special day. The Cowichan District Hospital Foundation and the David Foster Foundation receive funds raised from the 5th Annual Vancouver Island Motor Gathering. The Foundation enjoyed interacting with vehicle enthusiasts of all ages to bring awareness to the importance of organ donation. It was wonderful to see so many families out for a fun-filled day on the track. Motor Gathering will directly benefit those families, so that they may enjoy summer days together like those who came out to support the event. A huge thank you to Dr. Sylvester Chuang, GAIN Premium Dealer Group, Peter Trzewick, Cindy Mui, and all of the spectators and volunteers who attended to support this year’s Vancouver Island Motor Gathering. We look forward to seeing everyone next year on Sunday, August 26th, 2018! “Gain Dealer Group has proven time and time again that they are a strong leader in the NEW BRUNSWICK community by giving back to improve the lives of children and families on Vancouver Island and throughout British Columbia. The financial support that our Foundation receives from the Motor Gathering directly impacts our families by giving them the opportunity to be by their child’s side when they are faced with the most stressful time of their lives. For that, we are truly grateful.” Wendy Fung Graham, Ricki-Lee Jewell, and Lara Knudsen share the importance of organ donation with spectators at the Vancouver Island Motor Gathering. Honda Canada Foundation Partnership More than five million Canadians have benefited from Honda Canada and Honda Canada Foundation-funded charitable programs. annual philanthropic activities and funding to nonprofit registered charities across Canada where Honda customers and associates live, work, and play. The HCF focuses on four key pillars – family, environment, engineering and education. More than five million Canadians have benefited from Honda Canada and Honda Canada Foundation-funded charitable programs. “Supporting Canadian families in times of need is one of the four key pillars of the Honda Canada Foundation mandate and we’re proud to support the David Foster Foundation, as they provide guidance, comfort and much-needed financial support for transplant families across the country,” said Dave Jamieson, Chair of the Honda Canada Foundation. The David Foster Foundation is extremely thankful to have the support of the Honda Canada Foundation. he David Foster Foundation is very excited to announce a new national partnership with OUTFRONT Media Canada. On September 4th, 2017, the Foundation and OUTFRONT Media Canada launched the first national digital billboard organ donor awareness campaign in Canada. Today, less than 20% of Canadians are registered organ donors, yet each year over 1,600 Canadians are added to the existing organ transplant waitlist. To increase the national average, we need to increase organ donor awareness among Canadians, however, the cost to launch a sustainable National Organ Donor Awareness and Registration Campaign is significant. That’s where OUTFRONT Media Canada has stepped in, providing space across 109 digital billboards in five major cities: Vancouver, Edmonton, Calgary, Toronto and Montreal. This billboard space will be monumental in reaching the David Foster Foundation’s two goals– to encourage Canadians to register as organ donors, while increasing awareness about the need for donors, and to financially support the non-medical expenses of Canadian families undergoing pediatric organ transplants. OUTFRONT Media Canada has one of the largest and most diverse sets of billboard, transit, and mobile assets in North America. Through its ON Smart Media platform, OUTFRONT Media Canada is implementing digital technology that will fundamentally change the way advertisers engage people on-the-go. They have demonstrated their commitment to the David Foster Foundation’s cause by donating access to all 109 of their digital billboards, to launch a National Organ Donor Awareness and Registration Campaign that will reach new heights and touch more people than ever before. The campaign is expected to generate 800,000 impressions per day. This means that in a year, there will be almost 300 million impressions of the Foundation’s important message about organ donation. OUTFRONT Media Canada’s philanthropy and demonstration of corporate social responsibility will make a positive change in the lives of Canadians. The David Foster Foundation is proud and honoured to partner with OUTFRONT Media Canada to launch this first-of-its-kind campaign. Together, we can spread the message about the importance of organ donation, while ensuring that Canadian families with children undergoing life-saving organ transplants have a place to turn to for years to come. Keep an eye out for our message across billboards located in Vancouver, Edmonton, Calgary, Toronto and Montreal. You can be part of the solution by joining OUTFRONT Media Canada’s and the David Foster Foundation’s Organ Donor Awareness and Registration Campaign. Visit davidfosterfoundation.com and become a registered organ donor today. Keep an eye out for our message across billboards located in Vancouver, Calgary, Edmonton, Toronto and Montreal. OUTFRONT Media's billboards provide a valuable communication tool to the Foundation. 30 Years of Keeping Families Together – Here are the stories of just a few of the over 1,100 Canadian families that received assistance from the David Foster Foundation over the past 30 years. t only 3 ½ months, Laura required a life-saving heart transplant. Her transplant took place at SickKids Hospital in Toronto, ON. Laura has no memories of the transplant, however, growing up with medication and regular hospital check-ups became a part of her life. The David Foster Foundation has helped with her family’s annual trips to SickKids since she received the transplant in 2001. Today, Laura is a 16-year-old embracing and enjoying high school. In 2009, Laura went to Disneyland with the Children’s Wish Foundation and to the World Transplant Games in Australia where she competed with other transplant recipients. She is grateful for the support that David Foster Foundation has given her family which has made annual check ups to the hospital less scary and more like a chance to spend time together. hen Noah was only 6 months old, he had a heart transplant at the Stollery Children’s Hospital in Edmonton. Noah has no memory of his transplant, but one of his parent’s best moments during his recovery was David Foster visiting them at the hospital and playing on a piano with Noah’s feet. The David Foster Foundation provided financial support for Noah’s family while they cared for their sick son, ensuring that they would have a home to return to after his transplant journey. Noah’s family says not having the added pressure of finances allowed them to focus on the important things and they can’t imagine where they would have ended up otherwise. Noah’s transplant provided incredible results. His skin and lips became a healthy color that had been absent due to the low oxygen in his blood prior to the transplant. Noah was born blind, but gained his sight after receiving his transplant. His day-to-day struggles are still real, but his family is so grateful for the life that he has now. Today, Noah is 10. He has participated in both baseball and soccer in the Special Olympics, he rides horses in therapeutic riding, and he loves playing street hockey with his neighbourhood friends. His parents say he’s the happiest child you could ever meet and they are amazed by the kindness and compassion he has for others. fter only 4 ½ months with their precious new born, Phoenix’s parents would learn that their daughter required a heart transplant to live. 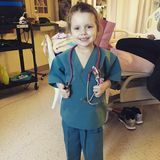 Phoenix suffered cardiac arrest on three occasions while waiting for her transplant and her heart was being supported by a Berlin Heart prior to the operation. She received her transplant at SickKids Hospital in 2009. Her parents recall the stress and fear they had for their little girl’s health and the confusion her siblings experienced during this time. The Foundation helped cover the costs of relocating to Toronto. They paid for long-term hotels and a short-term condo, ensuring the entire family could remain together and support each other. The Foundation also helped with meals and childcare for Phoenix’s siblings. Phoenix’s parents are grateful that the Foundation’s support allowed them to focus on what really mattered, being by their child’s side when she needed them the most. Today, Phoenix is a busy little girl in Grade 3. She loves to draw cats and bounce on her trampoline. She received a Gold Medal for swimming at the 2014 Canadian Transplant games. Phoenix is very close with her donor family and has had many vacations with them. Their incredible gift provides this little girl with the opportunity to grow and reach her full potential. .
hen Shelby was 14, she required an emergency liver transplant. After coming to this realization, doctors told Shelby she had 12 hours to live. The transplant would take place a province away at the University of Alberta Hospital. The Foundation paid for the family’s transportation, so that they could be by her side after the transplant. Shelby recognizes that having her family together was the most important thing for all of them. At age 28, due to complications with her first transplant, she was told she had three months to live. She sold her car and kayak, wrote a will, and planned her funeral. Going into her third month after the news, she was given another chance. This time her transplant took place at the Vancouver General Hospital. Shelby’s transplant experiences have given her an unbreakable spirit and positive perspective on life.